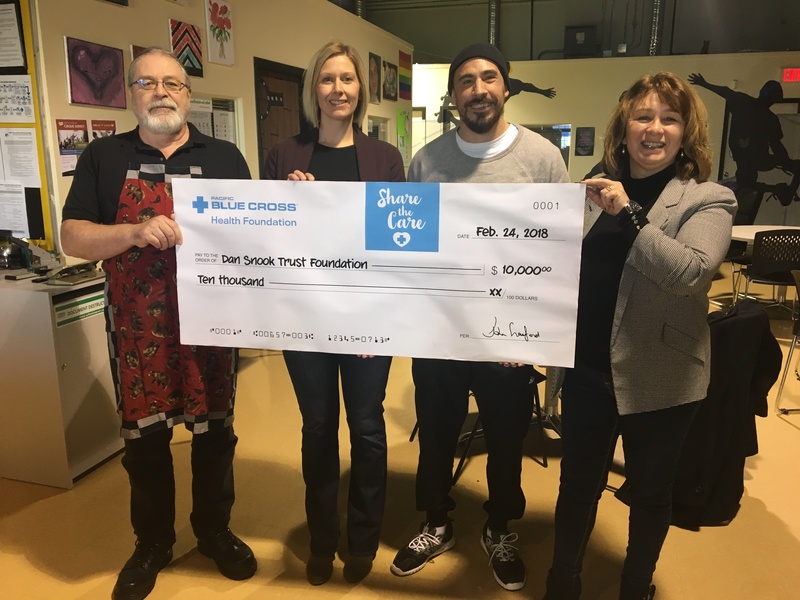 On Saturday, March 3, Sarah Arsenault from the Pacific Blue Cross Health Foundation dropped by our workshop in Surrey and presented us with a cheque for $10,000. The funds will go towards our Supported Program for Youth with Fetal Alcohol Spectrum Disorder (FASD) pilot program. Andrew, 16, is one of the youth with FASD who is taking part in the program. He’s extremely social but doesn’t have any friends, and was reluctant to take part in the workshops. He now says he loves going because the Mentor makes it easy to understand his diagnosis, and feels accepted and welcomed by his peer group. The pilot program wraps up at the end of April but plans are underway to continue the workshops in the Fall. Pictured in the photo are (L-R): Tom Littlewood (Program Director, Dan’s Legacy), Sarah Arsenault (Director, PBC Health Foundation), Myles Himmelreich (Program Mentor), Barbara Coates (Executive Director, Dan’s Legacy). Dan’s Legacy provides therapeutic counselling and life-skills intervention programs to youth affected by trauma-based mental health and addictions issues. In the past three years Dan’s Legacy has helped over 150 youth meet their educational, housing and life-goals. Pacific Blue Cross is British Columbia’s number one health benefits provider. Based in Burnaby, B.C., the not-for-profit organization provides health, dental, life, disability and travel coverage for 1 in 3 British Columbians through group benefits and individual plans. As part of its mission to improve health and wellbeing in B.C., Pacific Blue Cross proactively supports charitable organizations across the province working to improve health outcomes.